Summary: Greg Gaines is the last master of high school espionage, able to disappear at will into any social environment. He has only one friend, Earl, and together they spend their time making movies, their own incomprehensible versions of Coppola and Herzog cult classics. And all at once Greg must abandon invisibility and stand in the spotlight [x]. Review: I didn’t hate it but I didn’t love it. I felt no attachment to this book whatsoever. If you go through Goodreads it has mixed opinions. There are those like me who didn’t particularly hate it but it wasn’t for them. Then there are others who absolutely loved it. I found the characters fell a bit flat. As I said above I felt not attachment. There was nothing about these characters that I had a connection with. I did however like the different style the book was written in with the insertion of script and bullet points. I like when books do that. It gives the eyes something different to look at in comparison to blocks of text (That’s probably why I enjoyed House of Leaves by Mark Z Danielewski so much). I don’t have much to say. It seemed like it was trying to jump on the bandwagon of the The Fault in Our Stars (although they came out within in 3 months of each other s I doubt that intention). People like to read about sad things. This however elicited no emotion from me except maybe a laugh or two. 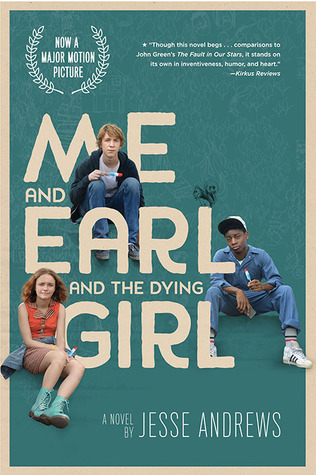 This entry was posted in book, book review, books, me earl and the dying girl, review. Bookmark the permalink.